I am excited to be here at Munchkin Munchies as part of a Virtual Cookie Exchange. 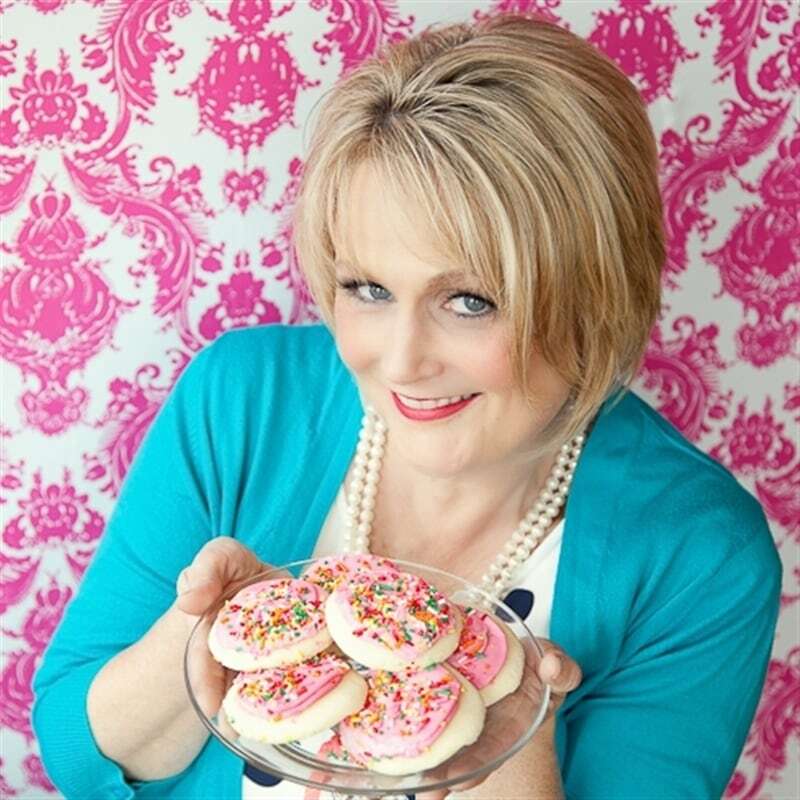 I am visiting from Your Homebased Mom where I share the pretty & delicious on a daily visit. I hope you'll come over for a visit. One of the things I love most about the holidays are cookies. I bake cookies all year round. I am particularly fond of chocolate chip cookies. Some of our family's favorites are chocolate chip cookies, peanut butter chocolate chip cookies and Nutella Chocolate Chip Cookies. But during the holidays we tend to take it up a notch or two in our cookie baking and there are certain cookies I only make during the holidays. 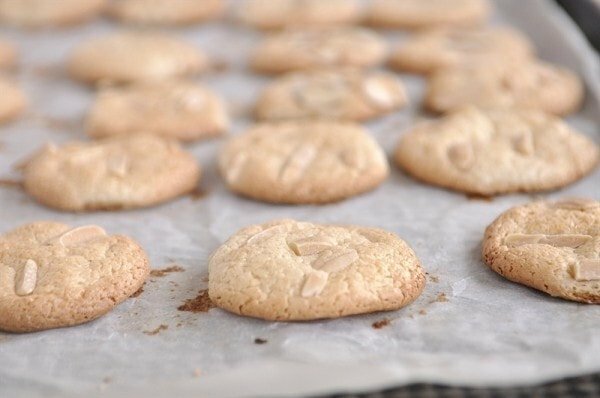 Today's recipe for Italian Almond Cookies is one of those special cookies. A good friend of mine first had these cookies at a wedding she attended. She came home raving about them. She made a batch and shared them with me and I had to have the recipe. 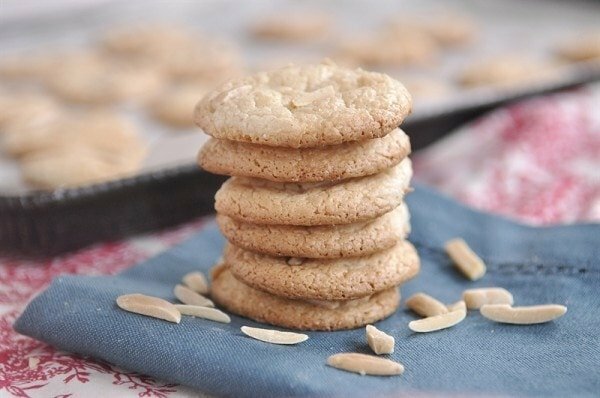 We are huge almond fans at our house and this recipe uses almond paste. 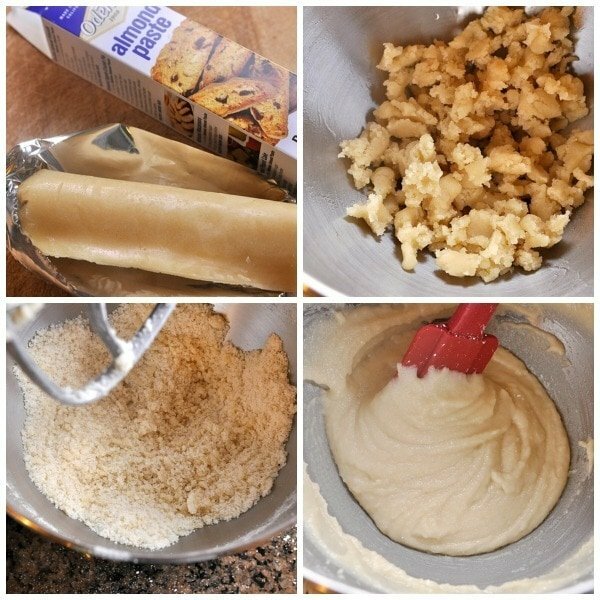 Almond paste is usually easily found a the grocery store in the baking section. I got mine at Target. This cookie has the same texture has a french macaron. It is a bit crispy on the outside but chewy on the inside. Sometimes they are even called Italian Macarons. I love the chewyness of the cookie and the crunch that the slivered almonds on top give the cookie. Lots of good flavor and texture going on all at the same time. The process is fairly easily. You first beat the almond paste until it forms small pea sized pieces. Mine didn't do this so I just used my hands and broke it up into small pieces. From there you add in sugar and small pieces will form. Then add in egg whites and beat for about 5 minutes. This will help them puff as they bake. I then used a piping bag and my biggest round tip and filled it with the batter. I then piped one inch circles about once apart onto a baking sheet covered in parchment paper. I put mine a little too close together and they did bake into each other a bit. Next time I would only put four in a row instead of five. Wet your finger and use it to smooth down the little tip that forms when you pipe. Then sprinkle with some slivered almonds and bake for 10-12 minutes or until they turn golden brown and start to crackle around the edges. Let the cookies cool completely on the parchment paper. A recipe makes about 2 dozen small cookies. Store the cookies in an airtight container to keep their edges crisp and chewiness in the middle. These cookies are delicious. They are a nice, light cookie and they practically melt in your mouth! 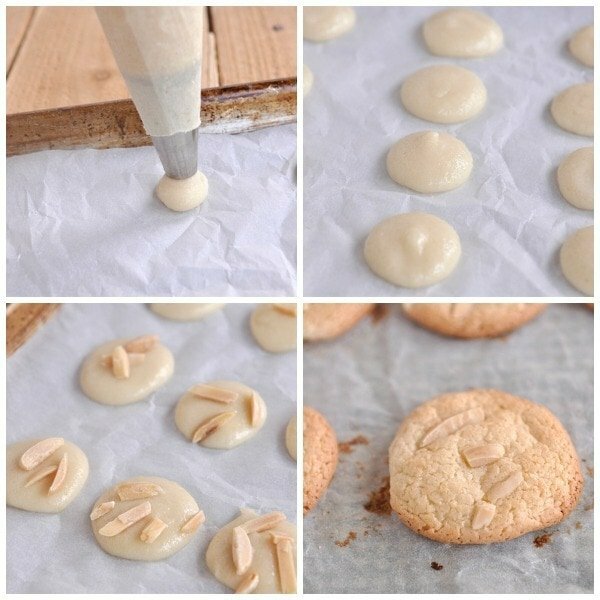 These Italian Almond Cookies would make a perfect addition to any holiday cookie plate you are putting together this season. 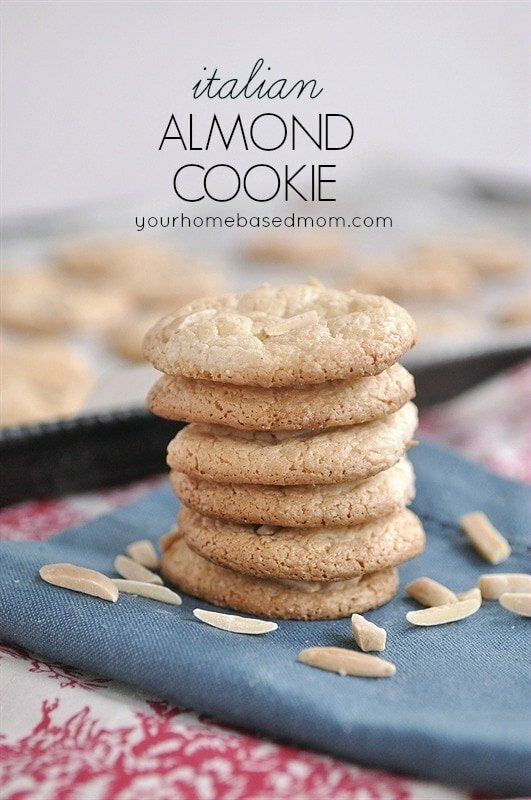 For some other almond goodness check out these recipes. Directions: In a mixer place almond paste and blend on low until pea (or smaller) sized pieces form. Approx. 2 minutes Add sugar slowly and blend on low until crumbs are smaller about 2 minutes Add egg whites in three steps blending well after each addition Mix on high speed for 4-5 minutes (set a timer, this step makes them fluffy after baking) Fill a pastry bag with batter using a large round tip Pipe cookies onto a parchment covered baking sheet. Make them about 1 inch in size and place 1 inch apart. Using a damp fingertip, smooth out the top. Sprinkle with slivered almonds. Bake at 375 for 10-12 minutes or until golden brown and edges begin to crack. Cool completely on the cookie sheet. Oh yum! Like I need another recipe to add to my cookie list ;) Can't wait to try them! What pretty cookies. 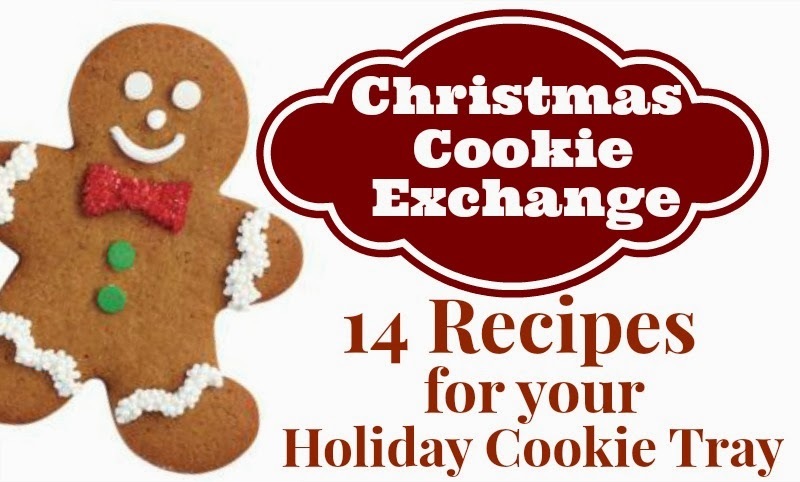 I love the virtual cookie exchange idea, but it is hard not to sample! Lovin the cookies Leigh-Ann. Pinned and thanks for sharing!! So fun to be sharing here on your blog today - thanks for having me! I have never baked with almond paste, but that is definitely going to change! These look so delicious! 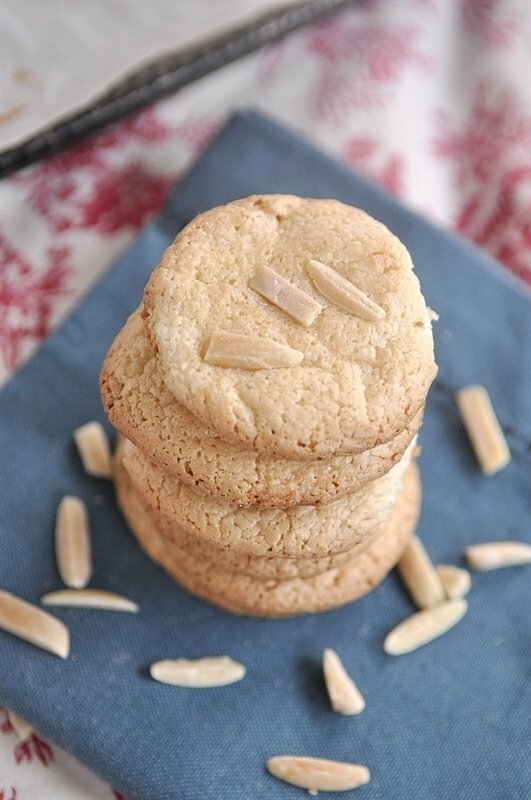 We love anything with almonds...those cookies are sure a great addition to the cookie box. What a unique recipe for the holidays! These look fantastic!! 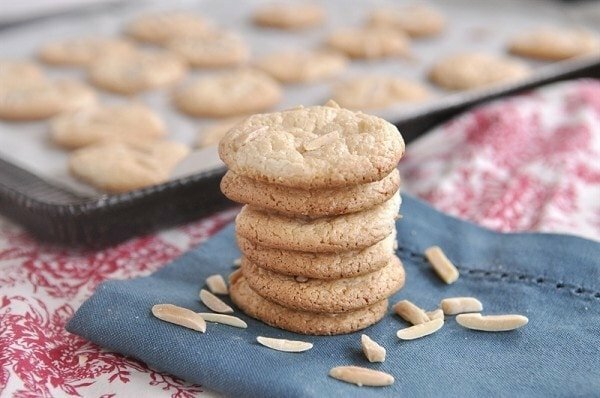 I love almond cookies! These look great! Mm, these cookies look so tempting! Thank you for the recipe! I've never tried almond paste before...hmm....I'm wishing I could have a taste of these cookies though!